In the Gospel of Luke, Jesus tells a parable about a man who throws a great banquet (if you’re not familiar, read Luke 14:15-24). A man prepares a big party for all of his friends and neighbors, and one by one, they all offer horrible (and highly offensive) excuses as to why they cannot come. The man then tells his servant to go out into the streets and invite in everyone that he can find to come and enjoy the party. It’s a beautiful picture of who is invited to come and be a part of the Kingdom of God. Lots of analysis has been focused on this interpretation. Whether it is the correct one or not is subject to debate, but you have to admit, it’s a good one! There are two main characters in this story, the man and his servant. It seems pretty obvious that the man is representative of God the Father, but who is the servant? Let’s take a look at these three observations as we drill down on how this passage helps to define the heart of an E(vangelist). Obedience may seem like an obvious trait, but it’s probably the most important for a healthy Evangelist (or any APEST gifting). The servant wouldn’t be very good at his job (nor would he keep it long) if he didn’t do what was asked of him, even when he might initially disagree. It starts off easy enough: “I’m having a party, go tell my friends everything is ready.” But it gets progressively more difficult. The friends reject and insult his Master, then he has to go out to people he doesn’t know in the streets and invite them in. It’s a scary prospect. This one action alone is most likely the reason we don’t see volumes of evangelists pouring out of the doors of the church. What we need is a shift. 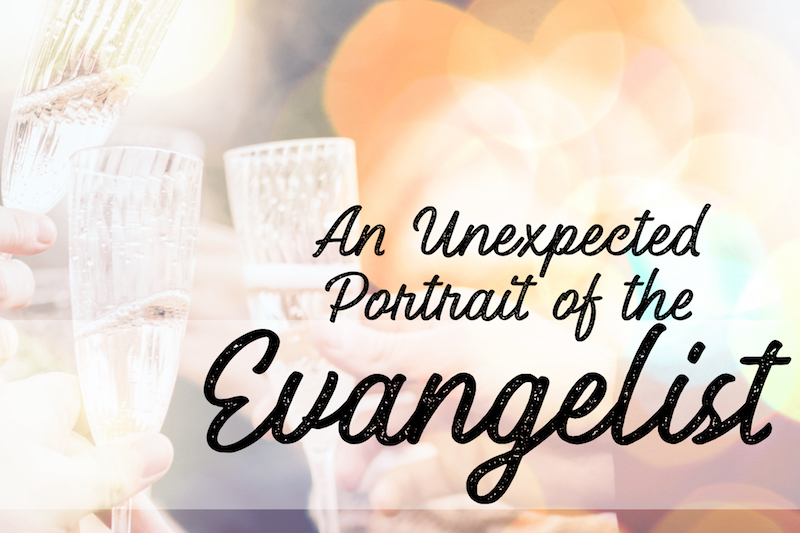 First, we need to see the work of evangelism through a lens that makes sense today. Check out this post for more on that. Even more, however, we desperately need a return to an obedience to Jesus that is greater than our fear of reaching out. The servant in the story helps us see the fruit of what joy can look like when the heart is more drawn to the will of the Master than its own. Through the process of obedience he begins to see what the vision of the banquet can be. He never questions his Master’s intentions, and as a result he is able to share in the joy of seeing the banquet full of people. What a strange characteristic to highlight for the evangelist. The point here is not so much about the fact that the evangelist gets rejected (see the Parable of the Sower), but about how the servant in the parable responds to that rejection. The servant doesn’t internalize it, and he doesn’t take it personally. Don’t miss the twist in the narrative: He is angry on behalf of the Master because of how rude the original invited guests are, and in fact, they are so rude that he gives up in frustration after speaking to only a few of them. But he doesn’t internalize that anger, and he doesn’t dwell on it. He conveys it to his Master, who in turn is angered, but knows how to respond. The mark of a great Evangelist is the ability to allow God to respond to rejection and not to internalize it, or in the words of Jesus to “shake the dust off” in response to rejection. And he doesn’t let the rejection get to him, because he never stops doing his Master’s work. There is never a point where he sits down and gives up simply because a few people didn’t respond to the message he brought them. We all experience rejection in some form nearly every day, and yet we keep going. When we have a goal in mind and are motivated to achieve something, rejection doesn’t phase us. If we’re searching for a job we don’t give up because the first interview didn’t go well. Or if we’re dating we don’t give up after one or two bad date. In addition to the mundane, we all have passion projects that we spend countless hours working on such as hobbies, artistic pursuits, home renovations, etc., where we don’t let any setbacks phase us. So how do we respond to rejection when eternity is the goal? Do we give up, or like the servant in the parable, do we sense the urgency and keep doing the work we are called to with resolve? This part requires a little bit of imagination on the part of the reader. When we read the text unaffected and alone, as we often do in Western Christian culture, it looses a lot of it’s punch. But we have to remember that this a story being told by Jesus at a party. It wouldn’t be much of a story if it only involved 2 dimensional characters spouting dialog back and forth. Why shouldn’t the servant be excited? His Master is throwing a party! After the insults that he sustained at the hands of the original guests, wouldn’t it be exciting to see the party proceed anyways, and to be full at that! The servant longs to see his Master’s vision of a full party realized, and as such he is excited as that vision comes to pass, just as the evangelist is excited and invigorated by bringing outsiders into God’s story of redemption. It goes without saying, but the Church is in desperate need of this servant type evangelist! We need thousands because the task is greater than any one of us can do alone, and the banquet still isn’t full. How does this post strike you? Where do you feel the most resistance as you read it? Does the passage inspire you? What does it inspire you to do? Share a bit in the comments. We would love to hear from you!